Beautiful property; well represented on VRBO We had a great visit. House was perfect. Really enjoyed the hiking trails right outside the front door. People in town very friendly and helpful. 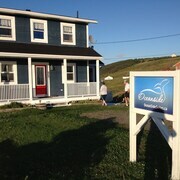 Perfect, comfortable, ideally located For our return to Newfoundland after 58 years, my brothers and I found the blue house sitting right on the cove just perfect. We Lived here as children and are now in our 60’s and 70’s. 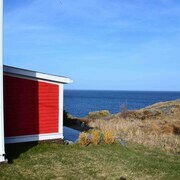 The house gave us a perfect location to enjoy rural Newfoundland as well as quick access to St John’s.